The New York Comic-Con is in full swing right now, and while we won't have any coverage from the convention in The Big Apple, we'll do our best to bring any big stories that come from the convention itself. 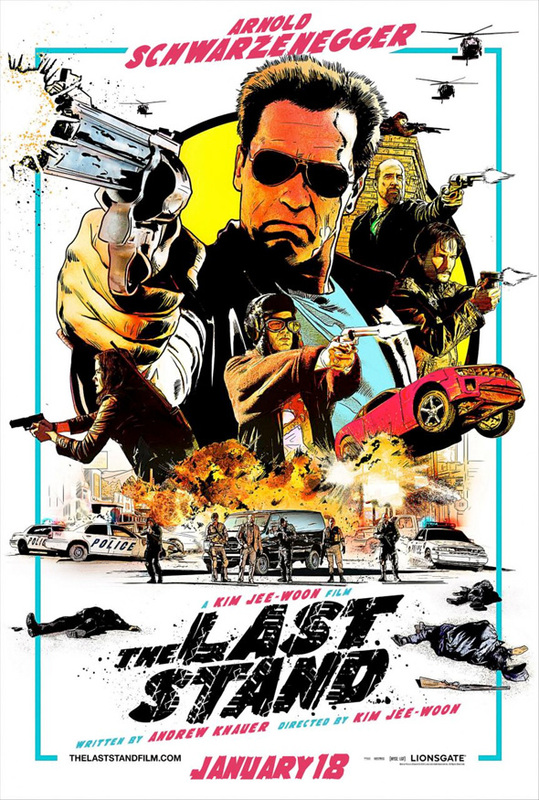 One cool bit has already surfaced in the form of an official Comic-Con poster for Arnold Schwarzenegger's first lead role since concluding his run as governor of California. A poster surfaced after Comic-Con in San Diego earlier this summer, but that turned out to be the work of a fan. A theatrical poster was revealed in August but this comic book style, illustrated poster is much better. Poster below! Thats an awesome poster. Effective because it makes him look younger than he really is...but I have a feeling that Johnny Knoxville's character in this is going to be annoying on a level of Jar Jar times ten. Damn these 1970s theme posters are back in a major way!!! Its bananas!